Ever wonder what a power supply looks like inside but you're too afraid to take the lid off? 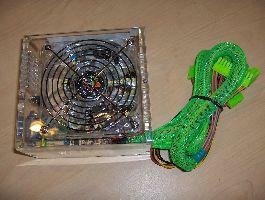 Ever buy one of those fancy clear acrylic cases and think "Man, now only if I could see through the power supply too?" Well the fine people at Logisys have taken these thoughts into account and created a power supply that is clear! 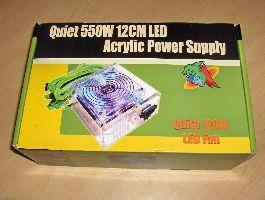 We introduce to you the Logisys 550W 12cm LED Acrylic Power Supply. While some power supplies on the market today can be as much as $130, the clear acrylic PSU costs only $44.99 and can jazz up your case in no time! "As the originator of clear power supply in the industry, Logisys has come up with another enhanced model PS550AC12 to respond to the increasing needs for quiet and better performed clear power supply. The power has a maximum 550W output, which comes with 20 and 24 pin ATX plug, two serial ATA connectors, 6 4pin 12v connectors, and PCI express connector. 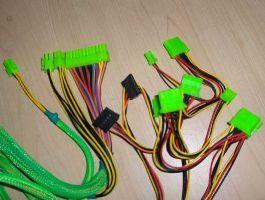 All the cables and wires have been sleeved with stylish green UV interactive nylon mesh. The cables and wires are extended to at least 19” up to 24” long in order to be compatible with almost all chassis, including the most of the full size tower. 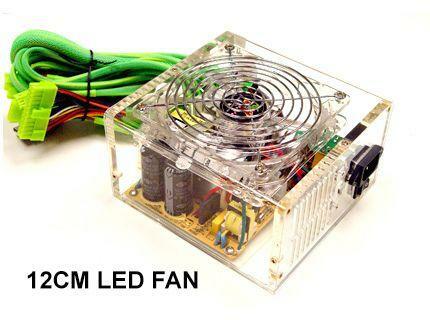 12CM blue LED fan is installed on top of the power to ensure maximum cooling and air circulation on most of the heated components inside." 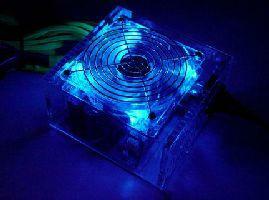 The Logisys Clear Acrylic Power Supply comes packaged in a bright and fun bright green box with powerful text. My eyes were immediately drawn to the large picture of the power supply, followed by the "quite" 12cm in the bottom right corner... Included is the power supply, a small manual, and foam packaging.